OK park, gravel sites, clean, the utilities work. Spaces are a little tight and some can be a little difficult to get in to. Stayed three days to hike, see the Gila ruins and walk around the shops downtown. The reason for the "5" rating was that after setting up and going to the office to pay, I was told that for the 3rd night I would have to move to another site. When calling ahead for reservations, I was told not a problem for 3 nights, which is technically correct, but who wants to move in a small park for one night. Somehow they were able to move things around in the 'computer' and we did not have to move sites. Lesson learned; when making reservations ask if the total number of nights are for the same site. Seems like a dumb question as one would assume it is for the same site. We camped at Silver City RV Park in a Fifth Wheel. This is a great little park. I highly recommend it if you are interested in doing things around town. Everything is spotlessly clean and well kept. Wi-Fi works great even though we were some distance from the office. Within walking distance of downtown. Right next door to a grocery store. We camped at Silver City RV Park in a Fifth Wheel. Small really clean park in the middle of town. Sonic fast food, Market Basket food store and Old Town Silver City are all within walking distance, check-in was quick and easy and the staff is very friendly and helpful. Wifi was very good, each site had a table and the hook-ups were in a handy spot. There is no cable TV, but off air signals were fair to good. we will come back again We camped at Silver City RV Park in a Fifth Wheel. This small park was a very pleasant surprise. We normally do not stay in commercial campgrounds, not to mention ones in the center of town. We were skeptical when we rolled in, but soon realized this was definitely a good choice. It is surprisingly quiet and is not located on a busy thoroughfare...We camped in a 33-foot 5th wheel and they found us a pull-through when we called 5 minutes before arriving. It was site #6, which was against a fence and required some vigilance when getting the rig into position to avoid running into a big tree. This was the only negative to our whole experience, but we've had much more challenging parking experiences...it only make you a better RVer, driver, etc., right? The free wi-fi was superb at our site, and fast! No cable TV, but was able to set up Dish Network no problem. The bathhouse appears to have been recently remodeled and tiled very tastefully, good water pressure and strong 30-amp power. The park hosts were exceptionally friendly, as was just about everyone in this great little town. Leave your car or truck at the park and walk 5 minutes to Bullard St (historic downtown), where there are lots of unpretentious mom and pop stores, and galleries (the antithesis of Santa Fe or Sedona in my opinion). We would stay here again. The park is well shaded with paved main road and everything else gravel, so no mud. Very clean park. 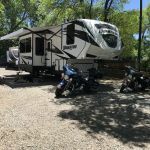 We camped at Silver City RV Park in a Fifth Wheel.